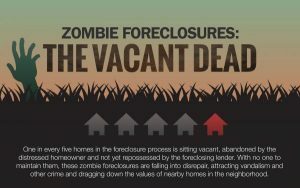 Home » Foreclosure » CAI-NJ CALL TO ACTION: Zombie Foreclosure Legislation is Scheduled for a Vote on Thursday, January 4, 2018! There are currently 1.35 million people who live in 6,700 community associations in New Jersey. This legislation will help every single one of these 1.35 million people. Zombie foreclosures plague nearly every one of New Jersey’s community associations, which puts a strain on the livelihoods of all our neighbors. Current law allows for an expedited foreclosure process on abandoned homes; however, this process is not mandatory and mortgage lenders are allowing abandoned properties to remain in foreclosure for years. This legislation (A-3823) offers fair options to mortgage lenders if they choose not to expedite the process in dealing with abandoned properties. You can click here to e-mail your Assembly-person. Or you can click here to find your Assembly-person’s telephone number (locate your town, note the district, then click your town, then click “Legislators for District ___”). As the Legislative Action Committee notes, contacting your state legislator today regarding this legislation is one of the most important things you can do to help the financial stability of your community association. You can read the full text of this proposed legislation here. For more information on this proposed legislation or any other issue concerning your community association, please contact one of our Community Associations attorneys. For breaking news or updates on new blog posts, follow us on Twitter at: @njcondolaw.